Traditional Home Magazine wants to help you make your home design dream comes true with the Traditional Home Spring Style Sweepstakes. Beginning on May 12, go to TraditionalHome.com/SpringStyle and enter for your chance to win a $10,000 check and a one-hour consultation with a Traditional Home interior designer via FaceTime. Enter as often as you want through June 30, 2017 for more chance to win the grand prize valued at $11,000. 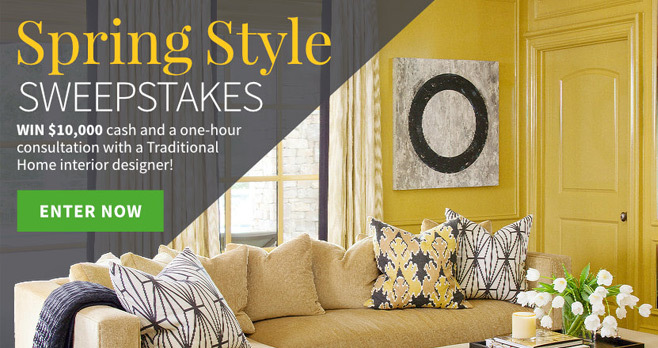 During the Sweepstakes Period, visit www.traditionalhome.com/springstyle. Enter your email address and password then click “CONTINUE” or log in if you are already a member. Fill out the entry form as directed by providing all requested information. Click “SUBMIT” to submit the online entry form and automatically receive one entry. There is no cost to register or enter. Each entry form submitted will result in one entry in the Sweepstakes Grand Prize Drawing. Begins at 12:01 a.m. CT on May 12, 2017 and ends at 11:59 p.m. CT on June 30, 2017. On or about July 7, 2017, Sponsor will conduct a random drawing from among all eligible entries received on the Website throughout the Sweepstakes Period to select one (1) potential winner. Approximate Retail Value of the grand prize package is $11,000. For the name of the winner, available after July 31, 2017, send a separate, self-addressed, stamped envelope to: Winner’s Name Traditional Home Spring Style Sweepstakes, 1716 Locust St., LS 321, Des Moines, IA 50309. For complete details, including Official Rules, visit TraditionalHome.com/SpringStyle.